Does this kitchen combo work? Dark walnut cabinet, moon white granite. Looking for tile flooring that's not too gray and cold, but not too warm that it clashes with the granite. What do you think? I like the countertop and floor individually but I don't think they're quite right together. Is there a warmer granite you might like just as well? A little too busy together. Do you like the wood look plank tiles? We just took out our porcelain tile floors that were in our kitchen and extended our wood floors all the way through. 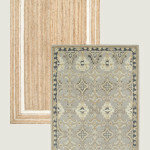 It made our layout look bigger and the natural wood floors go with just about any color combo. 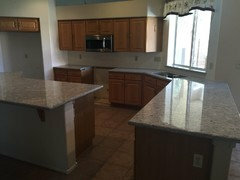 Here's a pic of lighter floors with the darker cabinets and lighter countertops. I'm not fond of the stone/tile choices being put together. The granite (smaller sample...correct?) is lovely but it has plenty of BLUE in it. That makes it a "cold gray". 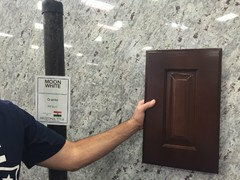 You've chosen a granite slab that forces you to go "cold gray"...which is what you are trying to avoid. That will be tough to do with the "cold blue gray" granite on the counter top. You either work with "cold white", "cold gray" or "cold blue gray". 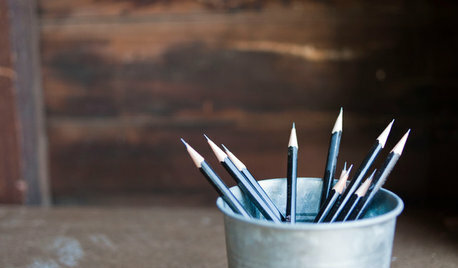 These are the colours that "work" with "cold blue gray". It will be VERY hard to "warm up" this floor. To do so, you would need to change the granite choice. 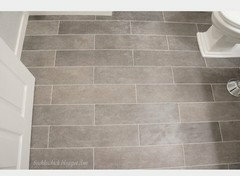 A simple porcelain tile (in the correct tones) would work better than the cream/gray tiles (larger gray sample underneath the small tile???). If you don't want a "cold gray" on the floor, you may have to change the "cold gray" on the counter top. We plan on running tile through the whole house except the bedrooms, probably 1500 sf of tile. Wood is too expensive and being in AZ, I love the way tile stays cool to the touch on my feet. I'm afraid of the house looking too sterile if we go with floor tile on the cool color spectrum. 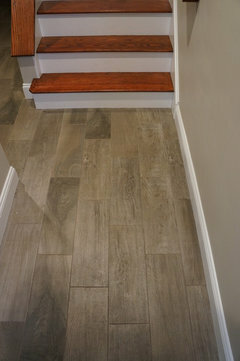 Porcelain wood plank may be an option depending on price. Any idea of a color tone on the porcelain wood look to use? I want to stick with lighter colors. Dust shows up too easily on dark floors (at least it does on dark wood laminate) maybe that's not an issue with wood porcelain tile? There are lots of wood-look porcelain tiles available these days, at all price points and in many shades. Go for something that's medium to light in tone. 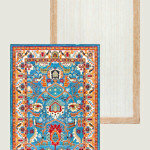 When they're installed, make sure they are installed randomly like a hardwood floor, not in any sort of repeating grid. I agree with several above comments, the wood look tiles are visually appealing, affordable and would keep the space from looking too cold. 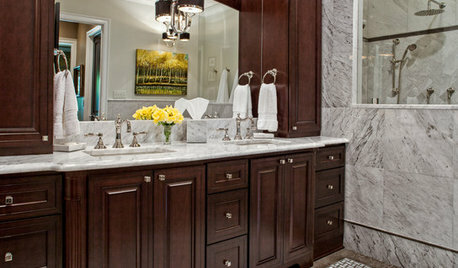 If you have not purchased the granite yet look into one with warmer tones and less variation. Granite with lots of variation, back splash with variations and floor will look way too busy. 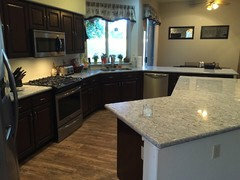 Also bold granite looks dated faster, is harder to match paint, cabinets everything! I really like the color tones of the large sample (floor?) but I'd regroup on the small sample (counter?). The little one is too cool and blue. @Elite Hardwood. What kind of floor is that? Too busy with the granite. 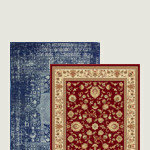 Both have a definite pattern which will become even more obvious when you see the entire floor with the whole counter. 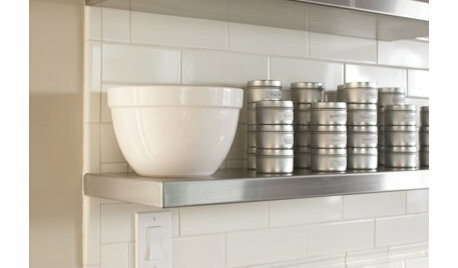 Consider using a solid color tile. 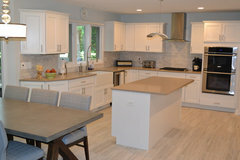 Take your granite sample to the tile store and look for a solid color w/no movement or pattern. Your granite looks almost blue-gray. 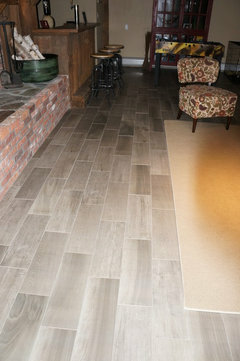 What about a slate floor? Hmm the slate look concept is interesting. 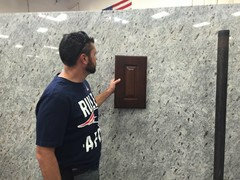 Here is the granite slab we got the sample from. We are looking at it again tomorrow. Am I imaging it or does the whole granite slab look warmer than the sample? Or is it wishful thinking? No, I see the slab as warmer than the sample as well. Interesting. That slab of Moon White granite goes beautifully with the dark cabinets. 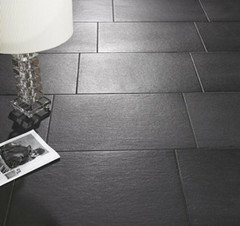 I love the idea of the slate or a slate-look porcelain on the floor, in a large format (12" x 24"). 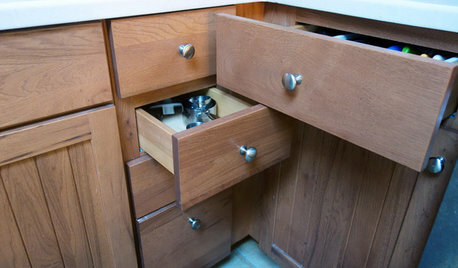 Pewter or brushed nickel hardware would be perfect with the cabinets and granite as well. As far as the warmth or coolness of the slab, it's very difficult to discern that on a computer monitor--you need to make that decision yourself in person. The slate or the "wood" tiles so far. 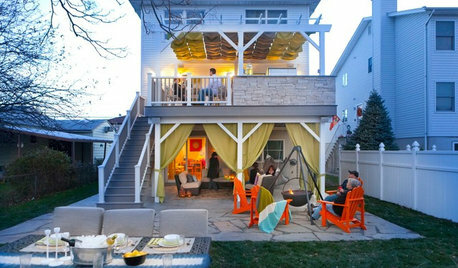 The ones you have above are in the same color family as your first choice with definite taupe beige tones. They are pretty but still shouldn't be in the same room with that granite. 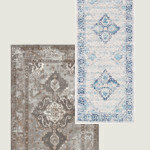 We took home around 15 different samples to see them in our home before deciding. I like all of the floor options and your cabinets just not that granite. Nope, the granite slab doesn't have any warm tones. I agree with Diane Todd, you've got to really pay attention to the undertones. 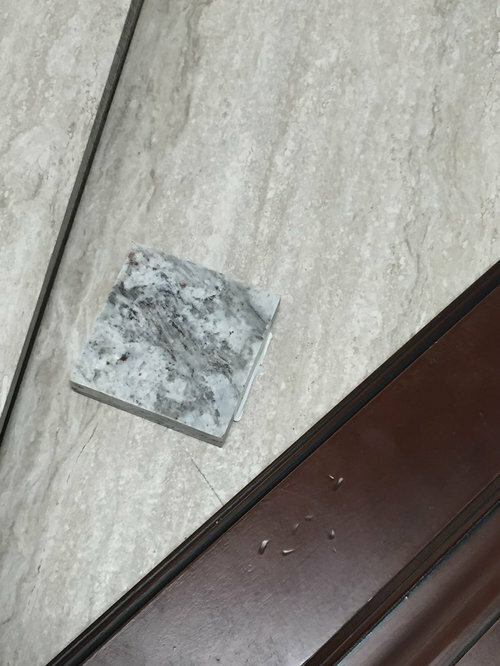 Don't focus on tiny specks of color in the tile or granite because when they're installed and you see the whole floor/counter those specks are going to disappear. 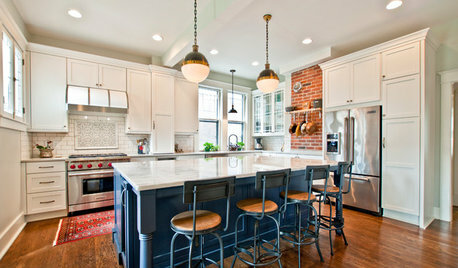 Putting together a kitchen color palette can be challenging! Went looking at more wood look tile. What do you think of this? 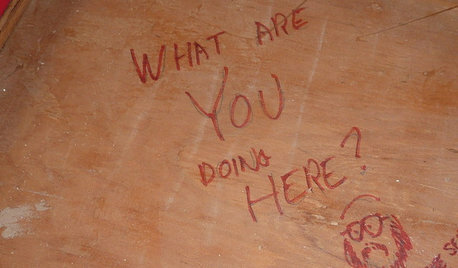 The granite is laying on the plank were looking at using. I like the one you're looking at using with the cabs and granite. 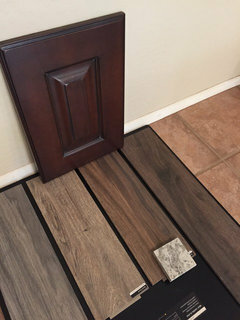 It looks like the one at the right is a longer plank tile. I would get the longest tile you can find; less busy. Oh, these are nice. I like the two in the middle the best. I think my very favorite is the one just to the left of the one with the granite sitting on it. I like its contrast with the cabinets. 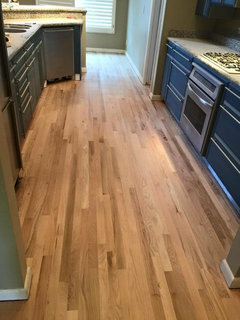 @Tess Wakefield its freshly sanded red oak flooring. Banjo, I'd be really careful with the granite samples. We made decisions only to find out the sample was a year old and the current slabs were very different in both color and veining. Fortunately, I went to the warehouse in Phoenix and was able to look at the slabs and make some quick changes. Good luck! 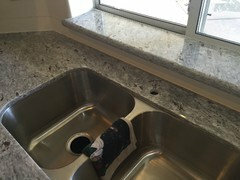 We got the granite installed yesterday. 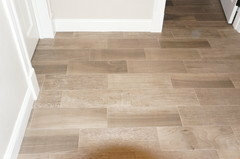 We ended up going with wood look porcelain plank floor, to be installed in 3 weeks. Next month we will have cabinets refinished. 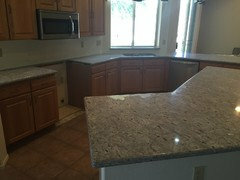 Here is the granite we got. Sorry lighting not that great. Kitchen all finished! I love the combo! Kitchen looks nice. I think I'd remove the valances, though. 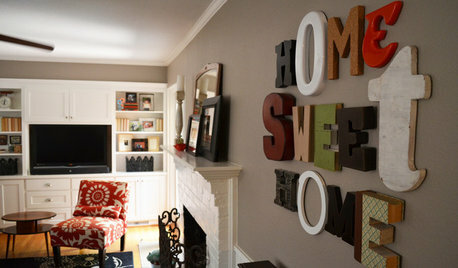 Are those mirrors or wall cut outs in the kitchen nook? If mirrors, I'd hang them as a vertical pair (not too high). 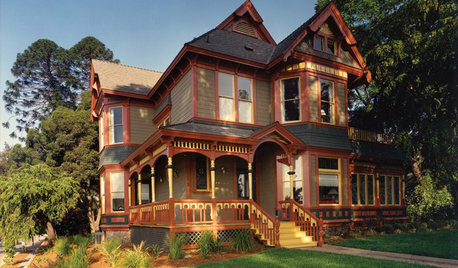 I plan on ditching the valances and replacing with cornice boards in the next few weeks. Dirty dishes, food scraps in the sink — will the madness ever stop? Does this tile combo work? what do you think of this combo for the kitchen? Problem! Downdraft won't work with cooktop/oven combo. Help please!